Our promotional fortune cookies have your own messages inside so they are produced to your own specific requirements and our fast delivery service means we can get your order to you within a few days of you making the initial enquiry. 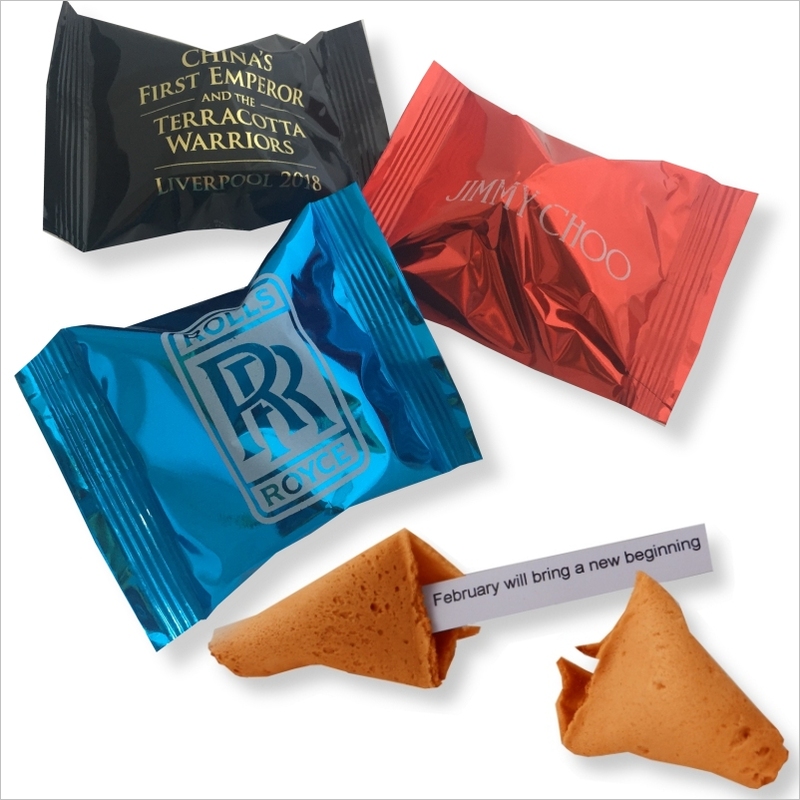 We can also print the wrappers with your own branding or text and can include logos and images on the message slips inside the promotional fortune cookies. Although we handle orders for hundreds of thousands of cookies our smallest production quantity is just 300 at a basic cost of £80. The basic cost includes a plain foil wrapper in a choice of colours. We can also print the wrappers. A one colour print can be produced in house and is suitable for production quantities of up to circa 10,000 and has the same leadtime as plain foil wrappers ie. 3-4 days. We can also print the wrapper via the wrapper manufacturer which is suitable for larger production runs or for logos of 2 colours or more. This incurs an additional leadtime of 4 weeks. We can also produce and affix miniature stickers to the wrappers which is suitable for smaller production quantities requiring a colour logo on the wrapper. We have a range of themed messages which can be printed inside the fortune cookies. These include traditional fortunes, motivational quotes, inspirational quotations, Christmas cracker jokes, children's jokes ... You can print all of the messages from one of these themes on one side of your message slips and your own message, logo, url etc on the reverse.